A normal posteroanterior (PA) chest radiograph. Dx and Sin stand for "right" and "left" respectively. A chest radiograph, colloquially called a chest X-ray (CXR), or chest film, is a projection radiograph of the chest used to diagnose conditions affecting the chest, its contents, and nearby structures. Chest radiographs are the most common film taken in medicine. Projectional radiography is a form of radiography and medical imaging that produces two-dimensional images by x-ray radiation. The image acquisition is generally performed by radiographers, and the images are often examined by radiologists. Plain radiography generally refers to projectional radiography. Plain radiography can also refer to radiography without a radiocontrast agent or radiography that generates single static images, as contrasted to fluoroscopy, which are technically also projectional. Radiography is an imaging technique using X-rays, gamma rays, or similar radiation to view the internal form of an object. To create the image, a beam of X-rays or other form of electromagnetic radiation is produced by an X-ray generator and is projected toward the object. A certain amount of the X-rays or other radiation is absorbed by the object, dependent on the object's density and structural composition. The X-rays that pass through the object are captured behind the object by a detector. The generation of flat two dimensional images by this technique is called projectional radiography. In computed tomography an X-ray source and its associated detectors rotate around the subject which itself moves through the conical X-ray beam produced. Any given point within the subject is crossed from many directions by many different beams at different times. Information regarding attenuation of these beams is collated and subjected to computation to generate two dimensional images in three planes which can be further processed to produce a three dimensional image. Ionizing radiation is radiation that carries enough energy to detach electrons from atoms or molecules, thereby ionizing them. Ionizing radiation is made up of energetic subatomic particles, ions or atoms moving at high speeds, and electromagnetic waves on the high-energy end of the electromagnetic spectrum. X-rays make up X-radiation, a form of electromagnetic radiation. Most X-rays have a wavelength ranging from 0.01 to 10 nanometers, corresponding to frequencies in the range 30 petahertz to 30 exahertz (3×1016 Hz to 3×1019 Hz) and energies in the range 100 eV to 100 keV. X-ray wavelengths are shorter than those of UV rays and typically longer than those of gamma rays. In many languages, X-radiation is referred to with terms meaning Röntgen radiation, after the German scientist Wilhelm Röntgen who discovered these on November 8, 1895, who usually is credited as its discoverer, and who named it X-radiation to signify an unknown type of radiation. Spelling of X-ray(s) in the English language includes the variants x-ray(s), xray(s), and X ray(s). Pneumonia is an inflammatory condition of the lung affecting primarily the small air sacs known as alveoli. Typically symptoms include some combination of productive or dry cough, chest pain, fever, and trouble breathing. Severity is variable. A pneumothorax is an abnormal collection of air in the pleural space between the lung and the chest wall. Symptoms typically include sudden onset of sharp, one-sided chest pain and shortness of breath. In a minority of cases the amount of air in the chest increases when a one-way valve is formed by an area of damaged tissue, leading to a tension pneumothorax. This condition can cause a steadily worsening oxygen shortage and low blood pressure. Unless reversed by effective treatment, it can result in death. Very rarely both lungs may be affected by a pneumothorax. It is often called a collapsed lung, although that term may also refer to atelectasis. Interstitial lung disease (ILD), or diffuse parenchymal lung disease (DPLD), is a group of lung diseases affecting the interstitium. It concerns alveolar epithelium, pulmonary capillary endothelium, basement membrane, and perivascular and perilymphatic tissues. It may occur when an injury to the lungs triggers an abnormal healing response. Ordinarily, the body generates just the right amount of tissue to repair damage, but in interstitial lung disease, the repair process goes awry and the tissue around the air sacs (alveoli) becomes scarred and thickened. This makes it more difficult for oxygen to pass into the bloodstream. The term ILD is used to distinguish these diseases from obstructive airways diseases. The thoracic cavity is the chamber of the body of vertebrates that is protected by the thoracic wall. The central compartment of the thoracic cavity is the mediastinum. There are two openings of the thoracic cavity, a superior thoracic aperture known as the thoracic inlet and a lower inferior thoracic aperture known as the thoracic outlet. 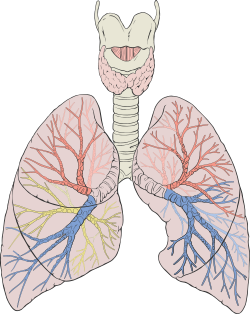 The lungs are the primary organs of the respiratory system in humans and many other animals including a few fish and some snails. In mammals and most other vertebrates, two lungs are located near the backbone on either side of the heart. Their function in the respiratory system is to extract oxygen from the atmosphere and transfer it into the bloodstream, and to release carbon dioxide from the bloodstream into the atmosphere, in a process of gas exchange. Respiration is driven by different muscular systems in different species. Mammals, reptiles and birds use their different muscles to support and foster breathing. In early tetrapods, air was driven into the lungs by the pharyngeal muscles via buccal pumping, a mechanism still seen in amphibians. 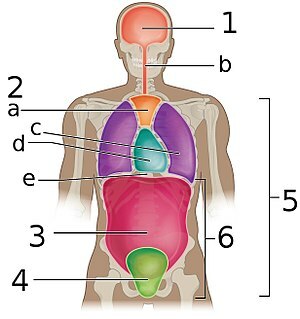 In humans, the main muscle of respiration that drives breathing is the diaphragm. The lungs also provide airflow that makes vocal sounds including human speech possible. The heart is a muscular organ in most animals, which pumps blood through the blood vessels of the circulatory system. Blood provides the body with oxygen and nutrients, as well as assisting in the removal of metabolic wastes. 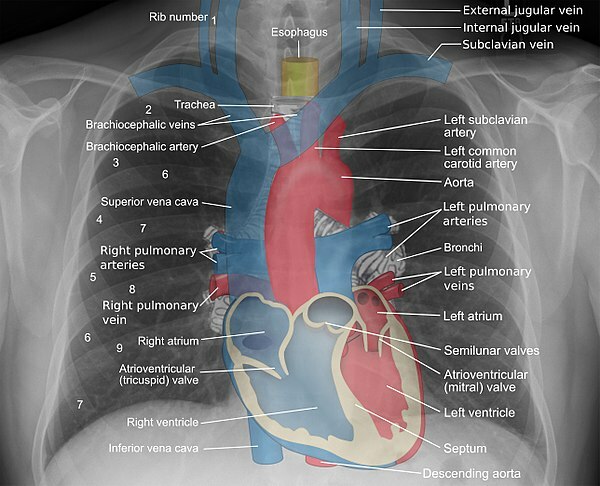 In humans, the heart is located between the lungs, in the middle compartment of the chest. For some conditions of the chest, radiography is good for screening but poor for diagnosis. When a condition is suspected based on chest radiography, additional imaging of the chest can be obtained to definitively diagnose the condition or to provide evidence in favor of the diagnosis suggested by initial chest radiography. Unless a fractured rib is suspected of being displaced, and therefore likely to cause damage to the lungs and other tissue structures, x-ray of the chest is not necessary as it will not alter patient management. Alveolar lung diseases, are a group of diseases that mainly affect the alveoli of the lungs. Different views (also known as projections) of the chest can be obtained by changing the relative orientation of the body and the direction of the x-ray beam. The most common views are posteroanterior, anteroposterior, and lateral. In a posteroanterior (PA) view, the x-ray source is positioned so that the x-ray beam enters through the posterior (back) aspect of the chest and exits out of the anterior (front) aspect, where the beam is detected. To obtain this view, the patient stands facing a flat surface behind which is an x-ray detector. A radiation source is positioned behind the patient at a standard distance (most often 6 feet, 1,8m), and the x-ray beam is fired toward the patient. In anteroposterior (AP) views, the positions of the x-ray source and detector are reversed: the x-ray beam enters through the anterior aspect and exits through the posterior aspect of the chest. AP chest x-rays are harder to read than PA x-rays and are therefore generally reserved for situations where it is difficult for the patient to get an ordinary chest x-ray, such as when the patient is bedridden. In this situation, mobile X-ray equipment is used to obtain a lying down chest x-ray (known as a "supine film"). As a result, most supine films are also AP. Lateral views of the chest are obtained in a similar fashion as the posteroanterior views, except in the lateral view, the patient stands with both arms raised and the left side of the chest pressed against a flat surface. Decubitus – taken while the patient is lying down, typically on his or her side. Useful for differentiating pleural effusions from consolidation (e.g. pneumonia) and loculated effusions from free fluid in the pleural space. In effusions, the fluid layers out (by comparison to an up-right view, when it often accumulates in the costophrenic angles). Lordotic view – used to visualize the apex of the lung, to pick up abnormalities such as a Pancoast tumour. Expiratory view – helpful for the diagnosis of pneumothorax. Oblique view – useful for the visualization of the ribs and sternum. Although it's necessary to do the appropriate adaptations to the x-ray dosage to be used. A chest radiograph with the angle parts of the ribs and some other landmarks labeled. Mediastinal structures on a chest radiograph. Fluid in space between the lung and the chest wall is termed a pleural effusion. There needs to be at least 75 mL of pleural fluid in order to blunt the costophrenic angle on the lateral chest radiograph, and 200 mL on the posteroanterior chest radiograph. On a lateral decubitus, amounts as small as 50ml of fluid are possible. Pleural effusions typically have a meniscus visible on an erect chest radiograph, but loculated effusions (as occur with an empyema) may have a lenticular shape (the fluid making an obtuse angle with the chest wall). Pleural thickening may cause blunting of the costophrenic angle, but is distinguished from pleural fluid by the fact that it occurs as a linear shadow ascending vertically and clinging to the ribs. Pleural effusions may occur with cancer, sarcoid, connective tissue diseases and lymphangioleiomyomatosis. The presence of a pleural effusion argues against pneumocystis pneumonia. A chest X-ray showing a very prominent wedge-shape area of airspace consolidation in the right lung characteristic of acute bacterial lobar pneumonia. Disease mimics are visual artifacts, normal anatomic structures or harmless variants that may simulate diseases and abnormalities. While chest radiographs are a relatively cheap and safe method of investigating diseases of the chest, there are a number of serious chest conditions that may be associated with a normal chest radiograph and other means of assessment may be necessary to make the diagnosis. For example, a patient with an acute myocardial infarction may have a completely normal chest radiograph. Chest X-ray PA inverted and enhanced. Projectionally rendered CT scan, showing the transition of thoracic structures between the anteroposterior and lateral view. A chest radiograph showing bronchopulmonary dysplasia. A chest film after insertion of an implantable cardioverter-defibrillator, showing the shock generator in the upper left chest and the electrical lead inside the right heart. Note both radio-opaque coils along the device lead. Pleurisy, also known as pleuritis, is inflammation of the membranes that surround the lungs and line the chest cavity (pleurae). This can result in a sharp chest pain with breathing. Occasionally the pain may be a constant dull ache. Other symptoms may include shortness of breath, cough, fever or weight loss, depending on the underlying cause. A pleural effusion is excess fluid that accumulates in the pleural cavity, the fluid-filled space that surrounds the lungs. This excess fluid can impair breathing by limiting the expansion of the lungs. Various kinds of pleural effusion, depending on the nature of the fluid and what caused its entry into the pleural space, are hydrothorax, hemothorax (blood), urinothorax (urine), chylothorax (chyle), or pyothorax (pus). A pneumothorax is the accumulation of air in the pleural space, and is commonly called a "collapsed lung". Pleural empyema is a collection of pus in the pleural cavity caused by microorganisms, usually bacteria. Often it happens in the context of a pneumonia, injury, or chest surgery. It is one of the various kinds of pleural effusion. There are three stages: exudative, when there is an increase in pleural fluid with or without the presence of pus; fibrinopurulent, when fibrous septa form localized pus pockets; and the final organizing stage, when there is scarring of the pleura membranes with possible inability of the lung to expand. Simple pleural effusions occur in up to 40% of bacterial pneumonias. They are usually small and resolve with appropriate antibiotic therapy. If however an empyema develops additional intervention is required. 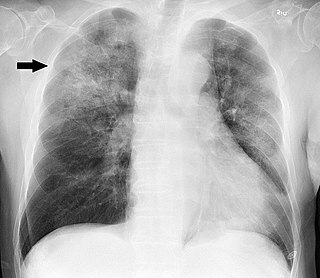 Radiology (X-rays) is used in the diagnosis of tuberculosis. Abnormalities on chest radiographs may be suggestive of, but are never diagnostic of, TB but can be used to rule out pulmonary TB. Hypersensitivity pneumonitis (HP) is an inflammation of the alveoli within the lung caused by hypersensitivity to inhaled organic dusts. Sufferers are commonly exposed to the dust by their occupation or hobbies. Thoracentesis, also known as thoracocentesis or pleural tap, is an invasive procedure to remove fluid or air from the pleural space for diagnostic or therapeutic purposes. A cannula, or hollow needle, is carefully introduced into the thorax, generally after administration of local anesthesia. The procedure was first performed by Morrill Wyman in 1850 and then described by Henry Ingersoll Bowditch in 1852. A pulmonary consolidation is a region of lung tissue that has filled with liquid instead of air. The condition is marked by induration of a normally aerated lung. It is considered a radiologic sign. Consolidation occurs through accumulation of inflammatory cellular exudate in the alveoli and adjoining ducts. The liquid can be pulmonary edema, inflammatory exudate, pus, inhaled water, or blood. Consolidation must be present to diagnose pneumonia: the signs of lobar pneumonia are characteristic and clinically referred to as consolidation. In radiology, the deep sulcus sign on a supine chest radiograph is an indirect indicator of a pneumothorax. In a supine film, it appears as a deep, lucent, ipsilateral costophrenic angle within the nondependent portions of the pleural space as opposed to the apex when the patient is upright. The costophrenic angle is abnormally deepened when the pleural air collects laterally, producing the deep sulcus sign. The costodiaphragmatic recess, also called the costophrenic recess or phrenicocostal sinus, is a potential space in the pleural cavity, at the posterior-most tips of the cavity, located at the junction of the costal pleura and diaphragmatic pleura. It measures approximately 5 cm vertically and extends from the eighth to the tenth rib along the mid-axillary line. High-resolution computed tomography (HRCT) is a type of computed tomography (CT) with specific techniques to enhance image resolution. It is used in the diagnosis of various health problems, though most commonly for lung disease, by assessing the lung parenchyma. A pulmonary laceration is a chest injury in which lung tissue is torn or cut. An injury that is potentially more serious than pulmonary contusion, pulmonary laceration involves disruption of the architecture of the lung, while pulmonary contusion does not. Pulmonary laceration is commonly caused by penetrating trauma but may also result from forces involved in blunt trauma such as shear stress. A cavity filled with blood, air, or both can form. The injury is diagnosed when collections of air or fluid are found on a CT scan of the chest. Surgery may be required to stitch the laceration, to drain blood, or even to remove injured parts of the lung. The injury commonly heals quickly with few problems if it is given proper treatment; however it may be associated with scarring of the lung or other complications. A subpulmonic effusion is excess fluid that collects at the base of the lung, in the space between the pleura and diaphragm. It is a type of pleural effusion in which the fluid collects in this particular space, but can be "layered out" with decubitus chest radiographs. There is minimal nature of costophrenic angle blunting usually found with larger pleural effusions. The occult nature of the effusion can be suspected indirectly on radiograph by elevation of the right diaphragmatic border with a lateral peak and medial flattening. The presence of the gastric bubble on the left with an abnormalagm of more than 2 cm can also suggest the diagnosis. Lateral decubitus views, with the patient lying on their side, can confirm the effusion as it will layer along the lateral chest wall. Subpulmonic space refers to the space below the lungs in which the subpulmonic fluid fills. Subpulmonic fluid is common particularly in trauma cases where the apparent hemidiaphragm appears defieted and the apex is displaced laterally. Rheumatoid lung disease is a disease of the lung associated with RA, rheumatoid arthritis. Rheumatoid lung disease is characterized by pleural effusion, pulmonary fibrosis, lung nodules and pulmonary hypertension. Common symptoms associated with the disease include shortness of breath, cough, chest pain and fever. It is estimated that about one quarter of people with rheumatoid arthritis develop this disease, which are more likely to develop among elderly men with a history of smoking. Tumor-like disorders of the lung pleura are a group of conditions that on initial radiological studies might be confused with malignant lesions. Radiologists must be aware of these conditions in order to avoid misdiagnosing patients. Examples of such lesions are: pleural plaques, thoracic splenosis, catamenial pneumothorax, pleural pseudotumor, diffuse pleural thickening, diffuse pulmonary lymphangiomatosis and Erdheim-Chester Disease. Asbestos-related diseases are disorders of the lung and pleura caused by the inhalation of asbestos fibres. Asbestos-related diseases include non-malignant disorders such as asbestosis, diffuse pleural thickening, pleural plaques, pleural effusion, rounded atelectasis and malignancies such as lung cancer and malignant mesothelioma. 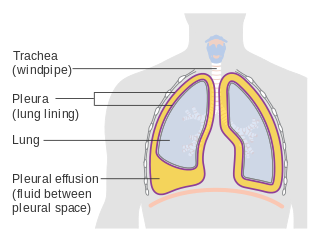 The pulmonary pleurae are the two pleurae of the invaginated sac surrounding each lung and attaching to the thoracic cavity. The visceral pleura is the delicate serous membrane that covers the surface of each lung and dips into the fissures between the lobes. 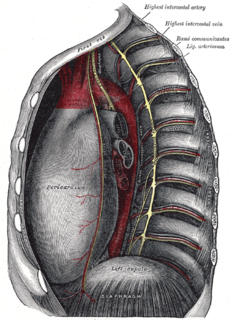 The parietal pleura is the outer membrane which is attached to the inner surface of the thoracic cavity. It also separates the pleural cavity from the mediastinum. The parietal pleura is innervated by the intercostal nerves and the phrenic nerve. ↑ "Radiation Dose in X-Ray and CT Exams". radiologyinfo.org by the Radiological Society of North America . Retrieved 2017-08-10. ↑ Using Digital Chest Images to Monitor the Health of Coal Miners and Other Workers. National Institute for Occupational Safety and Health. ↑ "Chest X-ray quality – Projection". Radiology Masterclass. Retrieved 27 January 2016. ↑ Bush, A; Gray, H; Denison, DM (February 1988). "Diagnosis of pulmonary hypertension from radiographic estimates of pulmonary arterial size". Thorax. 43 (2): 127–31. doi:10.1136/thx.43.2.127. PMC 1020754 . PMID 3353884. ↑ Gibbs, JM; Chandrasekhar, CA; Ferguson, EC; Oldham, SA (2007). "Lines and stripes: where did they go?--From conventional radiography to CT". Radiographics. 27 (1): 33–48. doi:10.1148/rg.271065073. PMID 17234997. ↑ Gandhi, Sanjay (December 7, 2013). Chest Radiology: Exam Revision Made Easy (1st ed.). JMD Books. pp. 541 pages. 1 2 Chest X-Ray, OB-GYN 101: Introductory Obstetrics & Gynecology. © 2003, 2004, 2005, 2008 Medical Education Division, Brookside Associates, Ltd. Retrieved 9 February 2010. 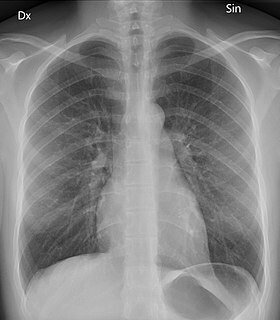 Wikimedia Commons has media related to X-rays of the chest .